The Store is now open for potato orders. These are certified seed potatoes from Hansens’ Farm in Cornell. Order now through May 22, and the potatoes will be here soon after that. Click here to order. This entry was posted in Uncategorized on 8 May 2017 by Charlie West. Onion Order Open till May 3! These are onion plants from Dixondale Farms in Texas. They come 50-75 plants per bunch for $4. Click on the Store link above and make your order now! This entry was posted in Uncategorized on 24 April 2017 by Charlie West. Abbey Palmer, Education Coordinator at the MSU North Farm, will bring her season extension supplies and demonstrate how to use a hoop bender and explain how to take advantage of the free tool library, which has expanded dramatically in recent years. Tools available to the public include hoop benders, wheel hoe, soil probe kit and soil blockers. Abbey will also be talking about the principles of season extension and give examples. We hope you can make it Thursday, April 20th @ 7 pm. This entry was posted in Uncategorized on 15 April 2017 by Charlie West. 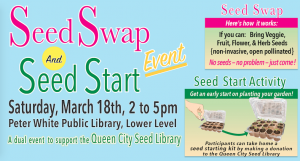 Seed Swap and Seed Start – it’s time!! Marquette Missionary Church, 1804 Wright St.
Presenters: Ray Bush, Farm Manager, Partridge Creek Farm; Lanae Joubert, Nutrition Educator, Northern Mich. Univ. Soil, site — and now seeds! Ray Bush, Farm Manager at Partridge Creek Farm, will work with us on planning a garden using the “square foot gardening method“. A special “work it thru” handout will be provided (bring a pencil). Count on a lot of Q + A . . . In addition, Lanae Joubert, an NMU nutrition educator, will give us examples of what we can grow that will provide the same or better nutritional value as the food that’s shipped from far away (at great expense) up to the U.P. No, you do not need to bring a pot of soil. This entry was posted in Uncategorized on 13 March 2017 by Charlie West. 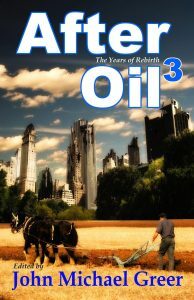 The Transition Marquette County Reading Group will discuss the stories in After Oil 3, selected and edited by John Michael Greer, on Thursday, March 9, at 7pm in the Conference Room at Peter White Public Library in Marquette. The twelve stories that make up the book are all set centuries in the future, when oil and fossil fuels are a thing of the past. New cultures and civilizations have begun to form, and a time of renewal has begun. Some seem like they would be pleasant stories to inhabit, others not so much. Part of our discussion will be over what makes the difference, and what insights that might give us for life today. This entry was posted in Uncategorized on 4 March 2017 by Charlie West. Seed Store Open for Business!! The seed store is open for business. We have a 15 variety Superior Collection to give a well rounded garden, as well as many other seeds, all chosen and proven to do well here in the UP!. Click the Seed Store 2017 link above! This entry was posted in Uncategorized on 20 February 2017 by Charlie West. Session #4 will be this Thursday, Feb 16, at the Marquette Missionary Church, 1804 Wright Street in Marquette, starting at 7pm. Growing perennials saves time and labor and preserves soil structure by not requiring replanting each year. This month, find out how to use perennials in edible landscaping and forest gardening through a permaculture perspective. Participants will actually propagate a perennial cutting to take home and plant. Wow, how’s that for a hands-on activity ? This entry was posted in Uncategorized on 13 February 2017 by Charlie West. The Transition Marquette County Reading Group will discuss the book “With Liberty and Dividends For All – How to Save Our Middle Class When Jobs Don’t Pay Enough” by Peter Barnes, on Thursday, Feb 9, at 7pm in the Conference Room at Peter White Public Library in Marquette. Barnes, co-founder of Working Assets Long Distance (now Credo Mobile) along with several other companies, notes the shrinking/disappearing of the middle class in our country, and the studies that document how a robust middle class is essential for a se cure democracy. He describes how our economic system is designed to steadily, little by little, year by year, shift wealth from the lower income levels to the higher ones. The rich get richer and the poor get poorer. This is designed into our system, and it will not change without changes to the system itself. He notes the four most proposed “pro-middle class policies” – stimulus, job creation, education, and innovation – and shows that while they are all good things, they will not be enough to sustain a healthy middle class. Taking a cue from Thomas Paine (“Common Sense”, “The American Crisis”, “The Age of Reason”, “Agrarian Justice”), he proposes adding a system of universal dividends to be paid to all Americans from money generated by user fees attached to our co-owned wealth – the things that belong to us all, either because they are a part of Nature or because they were created and given to us by former generations. Examples of such “common” or “co-owned” wealth include the atmosphere, the forests and lakes, the economic system itself, the electromagnetic (broadcast) spectrum, the intellectual property protection system (patents, copyrights, trademarks granted and enforced by the federal government). He shows how a mature system could generate dividends of $5000 per person per year – with no end in sight. This would supplement, but not replace, each citizen’s income from their individual labor. This entry was posted in Uncategorized on 25 January 2017 by Charlie West. Growing Your Own Food in the UP! Growing Your Own Food in the U.P! Miss Sessions 1 and 2 ? No problem — jump in now — you’re good to go ! Mike Riesterer will introduce a novel permaculture system he and his family have been developing over the last couple of years to help them build a sustainable system for growing food in the U.P. — not easy and not always successful ! Mike has implemented many permaculture-esque innovations which utilize natural sources of nutrition, an on-site fish pond and animal husbandry — all in a residential setting. He will walk us through his home-based system in a series of photos and diagrams. Four different soil building work stations will be set up for those who bring in their soil samples. so everyone should bring some soil ! Worm castings will be introduced to complete a biologically rich soil sample for starting greens or other plants in your windows all the way until (an early?) spring! This entry was posted in Uncategorized on 17 January 2017 by Charlie West.